Directions: Rinse face and neck with warm water. Apply cleansing creme to palm or soft facial cloth and massage gently over skin. Rinse thoroughly. Pat dry. pH balanced. Soap-free formula. Benefits all skin types. Avalon Active Organics guarantees 84% certified organic ingredients. Certified organic credibility requires the percentage of certified organic ingredients to be clearly stated on every label. 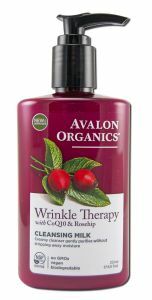 CoQ10 is Essential for Healthy, Youthful Skin Avalon Active Organics CoQ10 Facial Cleansing Creme is a gentle soap-free formula expertly blended with natural CoQ10, certified organic lavender floral water, aloe vera and green tea for maximum wrinkle defense benefits. Please Follow us to get sales and new item information updates! 1).Place the item in the shopping cart. 2).On the shopping cart page, enter your shipping zip code, state, country. 3). Click APPLY and your total cost is shown. Trade marks and logos are the property of their respective owners. Thank you for shopping Raymond & Co. We appreciate your business! � 1998-2019 All rights reserved.